A battered and bruised Neymar will aim to get Brazil's World Cup campaign back on track Friday as the pre-tournament favourites seek to re-assert their title credentials with victory over Costa Rica. 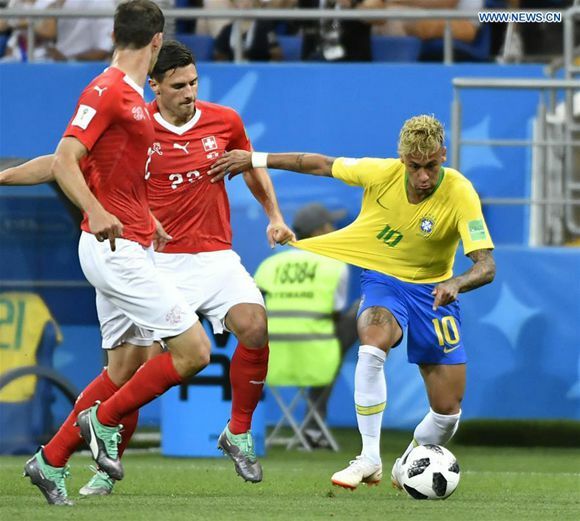 Neymar was given a rough ride in Brazil's disappointing 1-1 draw with Switzerland on Sunday, fouled 10 times during the match, the most for any player in a single World Cup game for 20 years. Even before his latest setback, there were doubts over Neymar's fitness heading into the World Cup after a three-month layoff. Instead, it was Philippe Coutinho who got Brazil's campaign off to a flying start with a wonderful long range strike to open the scoring. Should Neymar not be fit, Coutinho could be moved into his role on the left of a front three with Tite bolstering his midfield. However, Coutinho insists Neymar remains the key figure in Brazil's pursuit of World Cup glory. "Neymar is one of the best players in the world. Of course having him in our side is a big plus for us," said Coutinho. "He is so important. He is always creating the play, creating space." Brazil were not just unhappy with the treatment meted out to Neymar, but also Switzerland's equaliser when the Video Assistant Referee (VAR) system failed to rule out Steven Zuber's equaliser for a slight push on Miranda. The Brazilian federation even took their complaints to FIFA. They also lost heavily to Belgium and England in warm-up friendlies, but captain Bryan Ruiz believes they can follow Switzerland's example to cause another massive upset. "Switzerland pressed them in midfield and that's what you need to do because everybody knows that Brazil are best from midfield going forward," said the Sporting Lisbon attacker. "We need to win the ball back quickly and counter-attack quickly."